Welcome to my website. My name is Jordi Sanchez-Ballester. I'm a Consultant Orthopaedic "Foot and Ankle, Knee" Surgeon. Member of the examiners panel of the intercollegiate speciality examination in trauma & orthopaedic surgery, U.K. I'm also a Clinical Director of Trauma & Orthopaedics and Honorary Senior Lecturer Liverpool University. I specialize in arthroscopic (keyhole) and minimally invasive surgery of the foot & Ankle, Knee. My surgery uses advanced modern techniques for the management of bunions, arthritis and deformities of the foot and ankle. I routinely treat sports injuries with particular interest in ankle ligament injuries, Tendo-Achilles and Plantar-Fascitis pathologies. I hold an Honorary Senior Lecture post in Liverpool University and my NHS contract is at St Helens & Knowsley Teaching Hospitals NHS Trust. Additionally, I'm a partner in St Helens Orthopaedic Group and I practice in both The Fairfield Independent Hospital and Spire Cheshire Hospitals. I'm involved in developing and running academic programs for medical students, doctors and surgeons in training. 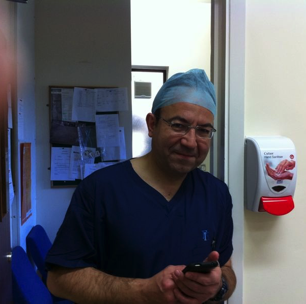 I'm also a member of the UK Intercollegiate Speciality Board in Trauma & Orthopaedic Surgery. Throughout my career I've lectured nationally and internationally on "Foot & Ankle, Knee" pathologies, and I'm published widely in medical journals. Also I'm a member of national and international professional organisations. I strongly believe in offering complete multidisciplinary "Foot & Ankle, Knee" treatment and I work with a dedicated team of Rheumatologists, Diabetologists, physiotherapists, podiatrists and orthotists at Fairfield Independent Hospital in St Helens. I've develpoed close links when referring therapists and clinicians, ensuring that their patients get the highest standard of care. For a referral for treatment, please contact me via the links at the foot of any page on this website.